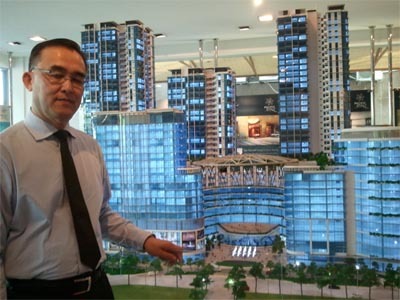 Ngan with a model of the Pacific Star project in section 13, Petaling Jaya. PETALING JAYA: Island Circle Development (M) Sdn Bhd will be joining the ranks of other developers to change the skyline and landscape of Sect 13, Petaling Jaya with an upcoming project comprising an office tower, a block of office suites, a retail podium and three blocks of serviced apartments ranging from 25 to 33 floors. The Pacific Star, with a gross development value of about RM900mil, would sit on the former site occupied by Star Publications (M) Bhd in Jalan 13/6, which had since been converted to commercial 99-year leasehold, MNH Global Assets Management Sdn Bhd general manager Ngan Yeow Meng said. MNH is a wholly-owned subsidiary of Island Circle. Ngan said the project, expected to be completed in 2016, would be part of a special project area designated by the Petaling Jaya City Council to be be converted to commercial use from industrial. The project is a 51:49 joint venture between JAKS Sdn Bhd, the contractor, and Island Circle respectively. Star sold the 6-acre odd land last year to JAKS Island for RM135mil. In return, Star will get a 13-storey office building with a gross build-up of 270,000 sq ft known as Star Tower. There is a 9-storey attached podium, part of which will be for retail use. Other components of the project include a 16-storey Beta office suite tower which consists of 258 units including duplex suites, with the smallest being 341 sq ft and duplex units of 560 sq ft.
Retail space will add up to a total of 350,000 sq ft over four floors. The retail space would be put on lease, Ngan said. There will be three blocks of serviced apartments at the back end of the project. Two of which will be 33-storey high and the remainder 25-storey tall. There will be about 2,000 units of parking space in the entire project divided between four levels of basement and five levels of elevated parking space. Ngan says the area has a plot ratio of 1:3.5 which means that it can build up to 3.5 times its land area. The office suites and two residental blocks will be open tomorrow and Sunday for the public to register their interest, Ngan said. The office suites and serviced apartments will be sold at more than RM700 per sq ft, with a maintenance service and sinking fund of 33 sen per sq ft. Utilities will be 25% to 30% higher than if it were on a residential title development. The units put up for registration this weekend include office suites ranging from 341 sq ft to 600 sq ft. The size of the serviced units open for registration ranges from 617 sq ft to 800 sq ft. The larger two- and three-bedroom units with build-up of 988 sq ft and 1,242 sq ft respectively will be sold later this year at a different price. Ngan said the former Star building, which was subsequently occupied by Universiti Tunku Abdul Rahman had been demolished, and piling work would begin once the company got the green light from the authorities. Ngan said Sect 13, bordered by Jalan Kemajuan, Jalan Semangat and Jalan Universiti, would be converted into a bustling special project area. Island Circle is also building Pacific 63, which is just a few blocks away from Pacific Star, adjacent to Jaya One. Already pockets of it have been converted to commercial use, this being Jaya One which sits on the former Aluminium Company of Malaysia site of nearly 11 acres fronting Jalan Universiti, Jaya 33 which fronts the commercial area of Sect 14 and Centrestage, another serviced apartment project. The 13-acre F&N factory land is also expected to be converted to mixed commercial development with hotels, office and service suites. PETALING JAYA: IGB Corp Bhd has agreed on a price of RM259mil or RM165 per sq ft with Selia Pantai Sdn Bhd for three parcels of leasehold land measuring 36 acres in Plentong, Johor. The land is for a proposed Mid Valley City-type mixed development, via a joint venture between IGB Corp and Selia Pantai. IGB Corp will have a 70% stake in the joint venture, with the balance owned by Selia Pantai. IGB Corp will fund its 70% portion of the project via internal funds and bank borrowings. IGB Corp told Bursa Malaysia that no valuation was carried out on the land, which is owned by Selia Pantai. The purchase price was arrived at on a willing-buyer-willing-seller basis, after considering factors such as the prevailing market value of properties in the same vicinity and surrounding infrastructure. SIME Darby has entered into a conditional agreement with CapitaMalls Asia Ltd to form a 50:50 joint venture (JV) to develop a shopping mall in Taman Melawati, Klang Valley. Sime is finally getting its act together in growing its property division, in line with the company's strategy to further unlock value for its property division through strategic joint ventures (JV). This JV shows the management's effort to further enhance and grow its property division. Investment in shopping malls would also generate recurring income. Property investment made up only 5% of the property division's pretax profit (7% of financial year ended June 30, 2011 profit before interest and tax). CapitaMalls Asia is Asia's leading shopping mall developer, owner and manager. It owns a few malls in Malaysia, such as Sungei Wang Plaza in Kuala Lumpur and Gurney Plaza in Penang. This development will be CapitaMalls Asia's sixth mall in Malaysia but it will be its first greenfield development in Malaysia. The shopping mall is strategically located at the centre of Melawati township and surrounded by established residential areas. This project would complement its on-going and future projects in the township. Sime has about 905 acres of landbank in the area. The shopping mall has a site area of about 242,000 sq ft and a total net lettable area of about 635,000 sq ft. The total development cost is expected at RM500mil (RM250mil for Sime) and it is likely to be funded internally given Sime's strong cash position. Marginal earnings impact (expected) from this JV. We are not expecting any material earnings impact arising from this JV in financial years 2012 to 2014 given that this development is scheduled for completion in 2016. Also, the property division contributed only about 7% of profit before interest and tax in financial year 2011. KUALA LUMPUR: Kimlun Corporation Bhd has secured a RM148.54mil contract to build the apartments and ancillary buildings in Shah Alam. It said on Friday its unit, Kimlun Sdn Bhd had accepted the letter of award from Esquire Corner Sdn Bhd for the project. Work is expected to be completed by September 2014.